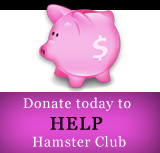 Hamster Club :: Join our hamster club on Facebook. follow us on Twitter and YouTube! Join our hamster club on Facebook. follow us on Twitter and YouTube! View and check new hamster updates not only on our hamster site but also on Facebook, Twitter and YouTube! If you already have a Facebook and a Twitter account, you will love joining us on Facebook at this link and become our fan at our hamster club fan page at this link. You can also follow us on Twitter at this link! Facebook is a social utility that connects people with friends and others who work, study and live around them. Several groups are formed and Hamster-Club.com may also be found on Facebook at this link or by making a search for "hamster-club.com". In our hamster group, one may post hamster pictures, discuss hamster issues and meet new hamster enthusiasts! Another option is Twitter. Twitter is without a doubt the best way to share and discover what is happening right now. One may follow us on Twitter with new hamster updates. You can also Like and Twitter our hamster articles, digg and more with a click of a button featured on our hamster pages! In our hamster site, you will find all you need to know about Hamsters; the different types of hamsters, their food, breeding, life span, housing and health. Also, you will find different interesting articles that will cover many aspects of hamsters, hamster games, hamster books, hamster videos, hamster products and much more! You may also check us out on YouTube. YouTube is very popular for the videos uploaded by many users which may also be accessible worldwide. 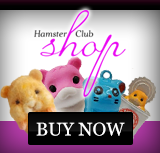 You may view Hamster Club's videos on YouTube by clicking here or check out our official partnered channel here. Feel free to email us, we always welcome questions, new suggestions and other hamster related activities.